​There’s a certain feeling of gratitude I have for modern technology. The ability to be in places like Central Mongolia and view the unpaved roads and sandy trails adds a sense of security from complete disorientation. I reveled in my new discovery of a simple iphone app that showed everything from highways to hiking trails. However, similar to paper maps, it’s not always updated. And this adds to the adventure of getting lost and knowing the importance of not relying on maps. I don’t have a great inner compass either so what I’m relying on could be described as simple and sometimes over zealous faith. That uncomplicated approach served me well through Australia and my short stint in Vietnam. Just check my map and feel my way ahead. I tend to teeter between asphalt, backcountry roads and trails that parallel highways. And sometimes I have no choice but to walk along a major highway. My favorite is dirt trails but more-often-than-not they aren’t heading in the same direction as I am. 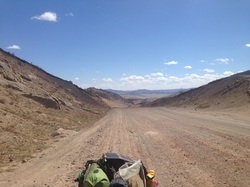 Mongolia offered me the opportunity to go as far off the road as possible, keeping in mind I was carrying almost 100 pounds on a two-wheeled cart made for an infant. I was always bulging over and no matter how much I thought I had slimmed down my supplies, I always seemed to be tipping the triple digits. I bought a cheap pair of snow boots at the Ulaanbaatar black-market, which reminded me a lot of Chinatown’s markets in NYC. Finding a pair of shoes in size 9 for a woman was almost impossible. I also purchased some insulated gloves, earmuffs and a beanie. 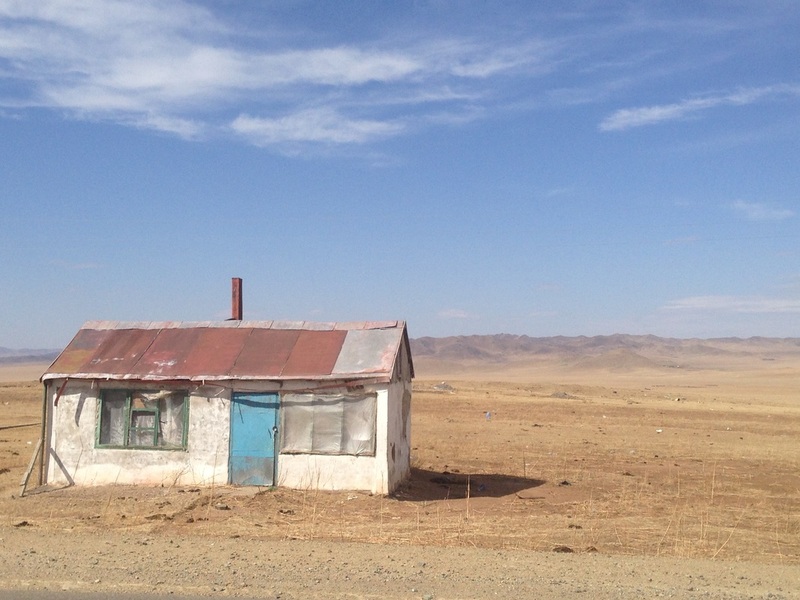 My hosts in Ulaanbaatar offered to drive me to the racetracks just outside the city, where I could follow the horse tracks that parallel the main road. The only road. Three days earlier was a massive snowstorm, covering most of the capital in three feet of snow. I had walked in temperatures above 110 degrees Fahrenheit and was looking forward to tromping in the white dirt. I began walking at 10 am. By noon I realized my snow boots were more like sneakers with ankle-warmers. My feet were sloshing and squishing with each step. I knew I was in danger of frostbite. But the wind had picked up and was directly devoted to kissing my face straight on. Luckily, the shoes were a bit big and allowed a bit of friction, warming my toes as they searched for a grip. And I lost any visual tracks, all covered in snow and mud. I was extremely slow, as I had to lean forward to tug and yank my cart through frozen patches of ice and melting sludge. The asphalt road was just about two football fields away. I couldn’t hear the vehicles, which was my reason for being so far away from it, but I could see glimmers of sun-reflecting windshields taunting me with their high speed. In the moments I was stuck in a foot of ice-cold mud and my carts wheels spinning in place, defiantly avoiding any movement in any direction, my eyes would gaze back over to the speckles of light flying across the black line. My back began aching and the already-thin air made me feel like I had never walked a mile in my life. 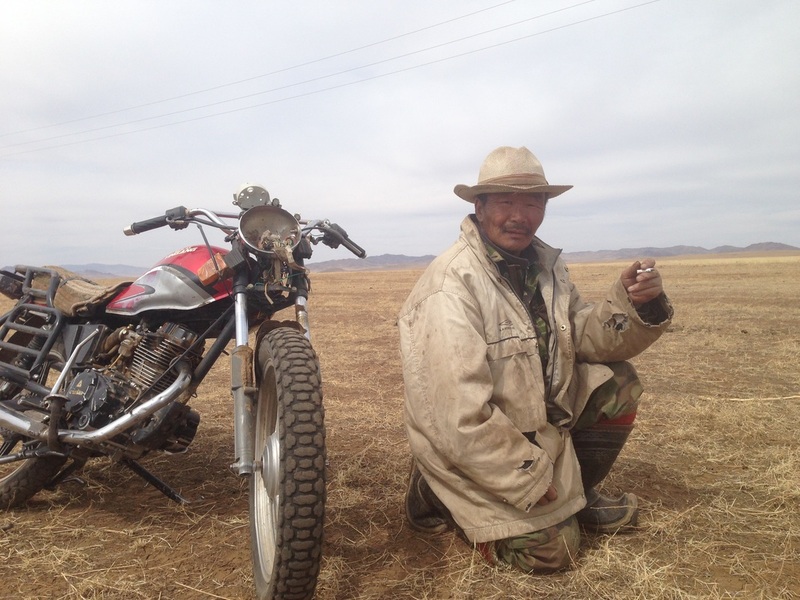 But here was my shot at being wild in the steppes of Mongolia. If I was ever to feel like a real explorer, to affectionately invoke my love for the brave Sacagawea’s that had gone before me, to live out my overly fantasized dreams of my youth, that could potentially leave me frozen, face-down in the middle of nowhere, only to be found by a yak herder, it would be here, in the hills and valleys of nomad territory. I would keep walking on the open fields, eventually finding dirt tracks and losing sight of the road completely as I headed for the steppes. I moved painfully slow in the snow. So much so that I was confident I could still see the place I camped the night before. But as the snow melted and green tufts of grass began sprouting through the cold mud, I felt proud for not going for the easier road. I celebrated not losing a toe or freezing in the snowstorm that had me blocked in my tent for three days. I could feel my instincts sharpening and began telling myself I could handle anything. And as I saw my first flower blossoming I thought the worse must be over. That was before I experienced the sandstorm. Nature would firmly humble me again. ​I sat defeated and disappointed on the edge of a protruding rock. It was a mighty skeleton of tree and boulders that was once a bridge; a bridge that was my link to continuing across the central steppes of Mongolia. A bridge that was essential to cross a sixty-foot-wide river. The cold wind curled around my neck and ankles as I sat there looking down over the strong current dancing around fallen logs. When I first outlined my route through Mongolia I was excited to follow horse tracks and corrugated dirt roads through dense mountains. As the sun melted the snow and evaporated the puddles I thought it must get easier from here; nothing could be more difficult than pulling one hundred pounds on two bicycle wheels through snow and ice. But there is. It’s pulling a hundred pounds through sand. What appears as a road on a map of Mongolia, in reality is a series of many sand paths that may or may not be heading in the same direction. There can be up to ten different paths within a few feet of each other, where eight of them will join back together while two may verge off to a settlement. At the top of the mountain ridge, a nomadic woman cocooned in a purple robe of traditional Mongolian style and a yellow headscarf that flickered gently in the breeze stood steadily still with a staff in hand amongst her flock of goats. As I panted warm tufts of vapor in exertion to get up the ridge a shape took form on her face. Her smile was a warm light in the cold. I slowly made my way towards her and noticed her hand was stretched out in my direction. Her eyes spoke to me with no words. I placed my palm in hers and her warm fingers firmly grabbed mine. She began rubbing my fingers as if starting a fire. It felt harsh and jarring at first but her kindness eased my clenched and cold body. 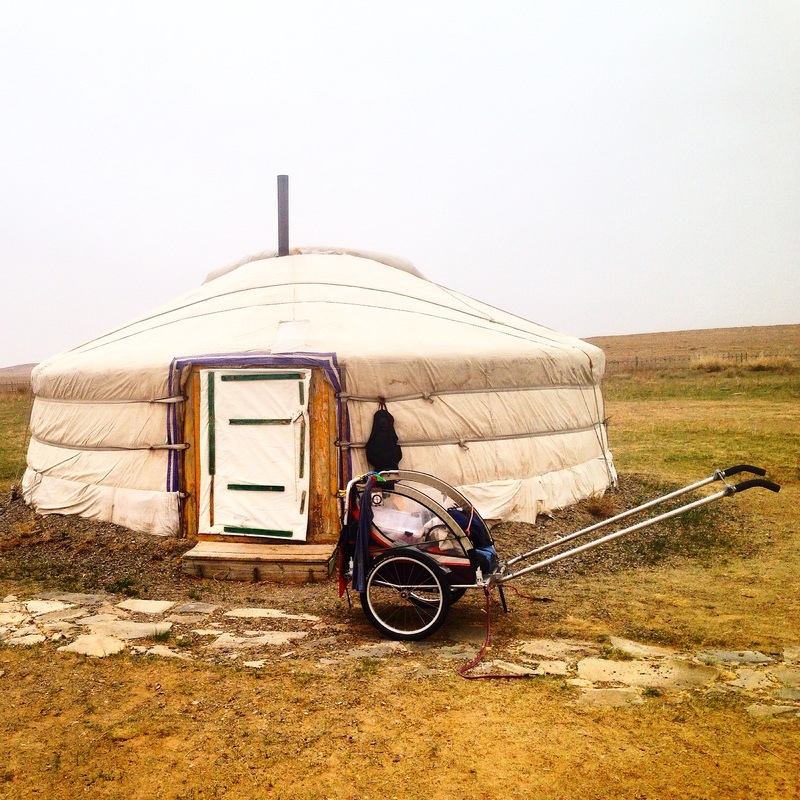 Then her finger pointed in the direction of her ger (a Mongolian yurt). I saw smoke bursting from the top and the thought of warming myself by the stove brought euphoria to my mind and body. Inside her home she began boiling water in a large iron bowl. This fit perfectly into the top of the stove. Then she placed assorted biscuits and a bowl of yak yogurt in front of me. I was pleasantly surprised to find it all very tasty and nourishing. Then she poured us both a cup of herbal tea, infused with yak milk. We sat in the warm silence on the floor next to the stove. I warmed my hands near the wood flames and occasionally we smiled at each other. Even if we could speak the same language, I felt that we would have been women of few words together, sharing kindness and recognition through our presence. I walked with her out to the barn where she pointed at a small wooden stool for me to carry. She lifted a heavy log that contained the yak in a circle enclosure and I closed it behind us. She pointed to a calf that was nursing from its mother and then to another enclosure that was small but empty. I had only a small handful of experiences on farms but my guess was that she needed to put the calf in the enclosure to keep it from feeding. She simply patted the wooden gate to the empty enclosure and I held it open as I watched her use her hips to shove the calf aside and then through the gate. 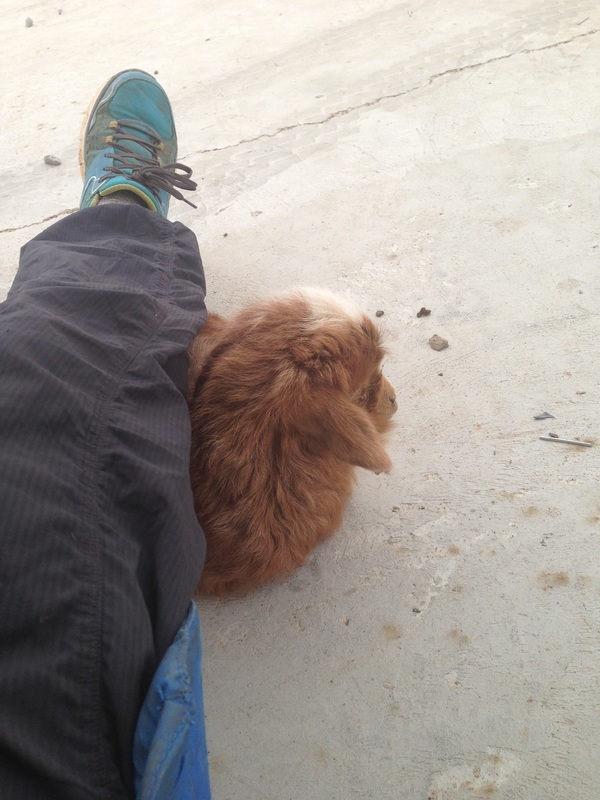 She took the stool I carried and placed it next to the mother yak. Then pointed at it for me to sit. She kneeled down, pushed the long hair aside and showed me how to milk the mother. It took several tries for me to get the rhythm and it was oddly comforting as she proceeded to lean against the wood posts and nod at me when she could hear the strong bursts of milk hitting the tin bucket. Back at her ger, she poured the warm milk into a plastic bottle and handed it to me. I could tell I only had three hours of sunlight left, so I packed the milk, offered my gratitude and stepped outside towards my cart. Calmly but with enthusiasm, she began shaking her head and crossing her arms in an X shape in front of her body. I knew this meant NO but I was confused at what this related to. She pointed in the downhill direction I was heading and kept shaking her head. “But I must walk. I’m sorry I don’t understand. Is there danger?” I mouthed my concern in English even though I knew she didn’t understand my words. She sighed, shook her head and patted my shoulder as she gave up on our charades. I smiled through my confusion and walked down the mountain towards the tree line, towards the water. My belly was warm and my heart full of magic. It felt so magical to have spent the afternoon with a beautiful and strong elderly woman that appeared as if she were waiting for me. I wondered if she was real or if my imagination and longing for feminine interaction had conjured such a dream-like experience. I wondered if I went back would there even be anything there at all on that mountaintop? I caught a glimpse of the stone and wood that lay half-buried by the riverbank. I now understood her unspoken words, no bridge. I sat momentarily in disbelief. But that soon became curiosity and determination. There must be a way to cross. Watching the river dive, twirl and twist, I sat on the edge of the bridge corpse and listened. I listened with my eyes and ears. I sat till my nose was numb. The sun was setting and the freezing wind was catching speed. I decided to set up camp. A warm meal would refresh my body and mind. I woke before the sunrise and made a cup of coffee. I took my spot amongst the ruins again and watched the sun wake the hills and warm the birds. Today I was going to try to cross the river on foot. The challenge with crossing the river was some of the obvious, strong current, unconfirmed depths, freezing temperatures and my own lack of experience. But even if I crossed successfully the first time, I’d have to do it four more times. My cart would have to be folded and tied and carried overhead along with my gear in separate bags. I wasn’t sure this would work but I had to give it a try. It was either walk a week south along the river to the next possible bridge or cross it here and now. After a few deep breaths, some procrastination, and a couple more cups of coffee, I began stripping. The wind licked my skin as I stood in my underwear and bra. I needed all my clothes dry to layer up as quickly as possible once I got to the other side. Although I had no experience with hypothermia I knew it was a possibility, as was drowning. I grabbed the smallest and lightest river bag, faced the current sideways and slowly crept in. It was mostly small rock under my feet making it difficult to gain a good grip. The water was cruelly frigid and I let out a loud howl followed by a maniacal laugh. I thought it was a risky idea from my perch but with my flesh dancing in the body of the river, I was coming to terms with just how dangerous this was. As I continued my grapevine into the river’s heart, the water crawled mid-thigh in a seductive current. I focused on keeping my knees bent and every step meant finding a new balance point. Steady, steady I repeated like a mantra. I could see the sandy island in a sensual closeness; perhaps another twenty steps and I’d land my body on the solid form. My right foot lead the way and on my next step I felt the ground sharply plummet down. The realization came after I stepped and found no foothold. I fumbled forwards, face-planting into the icy water. My body followed and I gripped my bag as it carried us downstream. The sound in my ears, like the ocean in a storm, captivated my senses and it was as if there was no thought or reaction. I was frozen and terrified. I was only aware enough to know that I had to grab something. I was floating towards the logs that had fallen from the bridge into the water. I didn’t have to try to swim to them, I was being catapulted right into them. A new fear hit me, I could be crushed at this speed. Throughout my journey I have found that every day there is a little miracle. A perfection of timing that reminds me that I am not alone. I cannot tell for sure but I believe I had time for a smile to stride across my face as I saw that my body was being carried towards a log pile that branched out from the riverbank. It was a dark mass that looked as if its arms were reaching out to catch me. I bent my knees into my chest, reached out with my right arm and quickly grabbed hold of a thick branch. I threw my bag on top and began climbing my way up using both arms and legs. I grabbed my bag and cuddled it like a child. I laid in a fetus position for several minutes, listening to the pounding in my ears and chest. I opened my eyes and stared across at the other side of the river. I would not be setting foot in that valley. The cold of my body slowly came into my consciousness. I got dressed and walked upriver to my gear. I believe in something more purposeful and powerful than luck, but it’s easy to say I was lucky to have landed on the same side as where I started and that I was lucky to leave the river unharmed. Water has an inherent ferocity and kindness about it. A demand to be respected for although it nourishes life it can also take it away from those who underestimate its power. 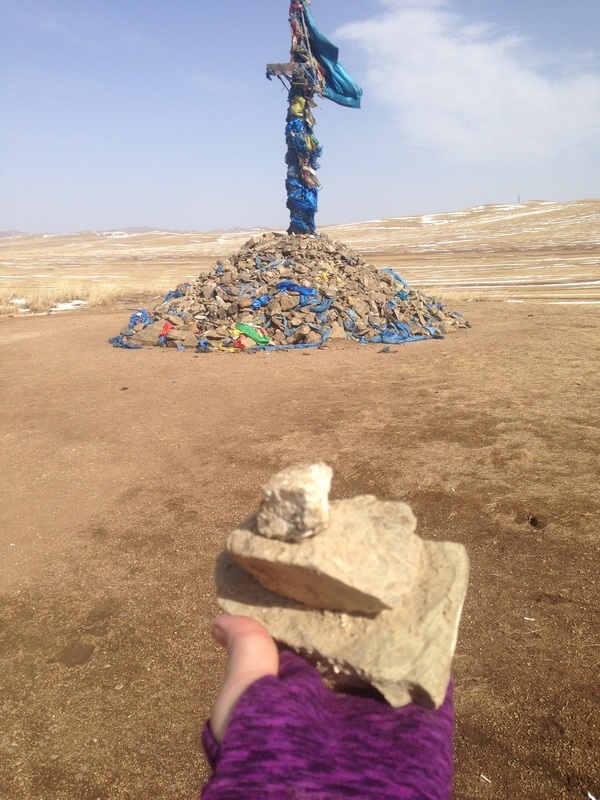 When I look back on that experience, I am aware that I could have easily become a memory, lost bones in the middle of Mongolia. The day before I crossed the river, a woman embraced me into her home with kindness and generosity. The day I tried to cross the river, it saw me safely but roughly to shore, reminding me that Mother Nature cannot be shaped or conquered. I packed my belongings and humbled heart and began my walk South towards the next bridge. ​There’s one thing that brings me joy, or better said, some sense of comfort about living in a tent- Pajamas. In the case of owning only five garments of clothing, my pajamas are basically the outfit I didn’t wear that day. And since I was destined to walk west across Mongolia, into a constant cold headwind, my pajamas were almost always my cotton dress. My routine is to start the stove or a fire to get water boiling while I ready myself for bed. I’m a bit of a hen, when it’s close to sunset I crave a womb to cozy into. Once I go in the tent, I prefer not to go back out. But on this night, there would be no flame. My stove pump wasn’t functioning and there wasn’t a tree in sight where I was camping in the steppes. The wind had just picked up, causing a loud flapping sound on the sides of my tent. Since the pajamas were on I was really hoping I wouldn’t have to go back outside. Basically, I got lazy. My tent requires only four pegs to take form and stand up but with another eight in the middle section make it the one of the best tents for extreme weather conditions. When I should have tightened the guy lines and added the extra eight pegs to prepare for the inevitable windstorm that seemed to visit me on a daily basis, I decided to cross my fingers and send some invisible faerie dust over the tent. Tired, hungry and cold made the decision that night. So after the pajamas went on, I began tackling the stove pump. I was eyeing a new dehydrated yak stew I found in the last village and was determined to fix the pump for a hearty meal. I pulled out the trouble-shooting directions and the repair kit. I got myself organized. A pile of O-rings to the left, the round plastic bits to the right and all the metals in between. The wind was becoming stronger. I had a moment of concern listening to the whipping of the tent but told myself, with all my gear and me inside the tent, it’s not like the wind would pick me up and carry me away. To get to the pump, I had to unscrew it off the top of my one-liter bottle half-filled with unleaded petrol. Considering the possibility of it spilling, I placed it in front of me, so I could keep an eye on it. It was too windy to put it outside. As I added lubrication and two new O-rings, I was getting close to fixing the problem. A loud bang sound to my left and the bright orange of my sleeping bag I was sitting on flashed before me as I felt a strength trying to lift me from underneath. Thunder-loud flapping as I scrambled to grab my pegs and hammer as I frantically searched for the zipper to the entrance door. I crawled quickly out and headed directly to the corner edges of my tent to secure them back down. The wind was like a cold brillo pad rubbing sand across my skin. There was no visibility further than the length of my arm. As the first peg went into the cold, hard earth, the other three were torn out again. Afraid of losing the tent and all belongings with it, I sat in the middle of it, holding it down while I gathered my thoughts. The wind whipped my hair and handfuls of sand in my eyes and mouth. I focused on the direction of the wind. And with my body still holding down a portion of the tent, I crawled into the wind. I secured the first two corners that were positioned into the wind, then inching my body lengthwise along the tent, I placed all six pegs holding the edges of the tent down until I got to the last two corners. I pulled the guy lines as taught as possible and did one more quick crawl around to make sure all pegs were sturdy. The thorough check was more tactile than visual. I crawled back into the tent and quickly zipped it up. I collapsed onto the disheveled pile. I laid soaking in the quiet bliss of silence in my ears as the wind continued to work to a crescendo outside the thin plastic fabric. I couldn’t think about how much sand was now in every crevice of my body and now filling the corners of the tent. As I enjoyed the comfort of being back in my round abode, the fumes of the petrol began burning my nose. Light headed, I searched for the bottle in the array, discovering what I already knew, there was no more liquid in it. All the petrol had spilled on several of my clothes, the tent flooring and the bottom half of my sleeping bag. Even with the tent door open and wind fighting to fill it, I couldn’t escape the smell and high effect. I laid with my head half out of the tent till my ears became numb. I wiped down what I could with some alcohol pads from my emergency kit. I fell asleep high that night. I would never use my tent without all ten pegs again.